The solvent trap adapters comes in different thread sizes. This solvent trap adapter has AR10 size threads, which are 5/8 x 24 right hand threads. It will fit any caliber gun that is threaded 5/8x24RH. 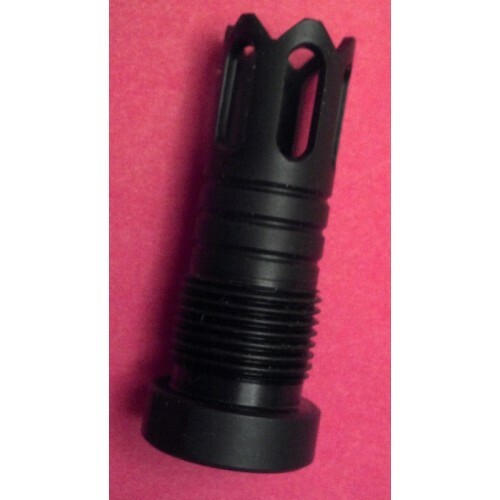 This solvent trap is made of steel, black in color and the shape is like a muzzlebreak/flashhider and made in the USA. NOTE: Whenever cleaning your gun make sure the gun is unloaded and pointed in a safe direction before removing or attaching anything to the muzzle of your firearm or cleaning your gun. NOTE; Solvent Trap , is a registered trademark of Tom Cole, and the Solvent Trap is patent pending. Solvent Trap Adapter, AK-74 with 24 mm thread base.